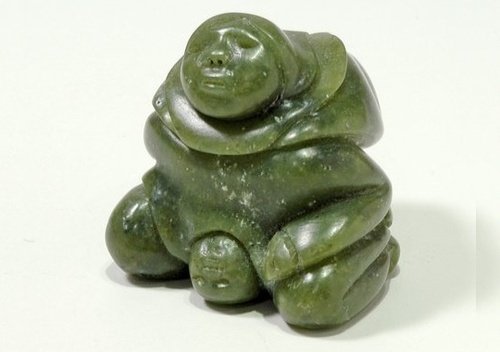 Silas Kayakjuak is an Inuit artist from the Nunavut Territory of Canada. Born into a family of carvers, Kayakjuak has carved many images of the human form into stone over the course of his career. There is a warmth and calmness to his carvings, found also in this small sculpture of a woman giving birth. The crowning baby emerges fully from the woman’s form while her facial expression remains strong but serene. The woman’s entire body concentrates on the birth of the baby, pressing forward and resting in a squatting position. Carved in serpentine, the sculpture is round and smooth, adding a tactile element to its sense of calmness. One senses that such an object could be very helpful to the pregnant woman were she able to touch it and meditate on its form while in labor! Although this work has already been sold, other commercial art related to birth does exist and could feasibly be used in such a way.